When you’re planning a relaxing evening at home or hosting a dinner party, a shimmering glass of wine often sets the tone. But what’s the best way to start those grapes flowing? The wine bottle opener you use can contribute or detract from the evening you have planned. Whether you are looking for the first wine bottle opener for your kitchen and bar, you are updating your tools and gadgets, or you are purchasing a gift for someone else, there are two primary style choices for wine bottle openers. You can continue with tradition and choose a waiter, butterfly or lever style manual bottle opener. Or you can select a more modern, innovative electric wine bottle opener. Is An Electric Wine Bottle Opener The Right Choice For You? Electric wine bottle openers have actually become almost as common as the traditional hand-held openers today and are available everywhere from wine cellars to department stores. Below are reviews on our top editor picks, as well as a guide to assist you in determining whether an electric wine bottle opener is right for you, and if so, selecting the bottle opener which suits you best. If you hate opening wine bottles with a manual wine bottle opener, you will love accomplishing this task with a one-touch automatic wine bottle opener. This innovative bottle opener has a built-in cutter that makes removing the foil at the top of the bottle a breeze, and it makes removing the cork just as easy. It quickly removes corks that are made of man-made materials, as well as corks that are made of materials produced by Mother Nature. It is sleekly and handsomely designed, making this hand-held automatic bottle opener pleasing to the eyes and comfortable to use. Pros: Safe and easy to use. Cons: As battery gets low, it can malfunction or not work properly. The Brookstone Automatic Wireless Wine Opener runs on 4 AA batteries that provide you with the power you need to uncork 150 bottles. It is 3 by 3.8 by 10.5 inches in size and light in weight. The stand it comes with is included. This modernly designed wine opener makes opening bottles of wine a breeze! 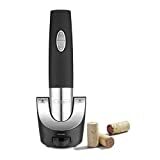 This rechargeable battery operated cordless wine opener can remove a cork in as little as 7 seconds. It comes with a foil cutter that will neatly unwrap and efficiently remove the foil. The rechargeable base will indicate when the opener is fully charged with a blue light, and after charging can open up to 30 bottles of wine without recharging. The Brewberry electric wine opener is ideal for those that struggle with traditional wine openers. It opens the bottle with a simple push of the one button, and it will do the work for you. Place it over a bottle of wine and push the button; it will turn until it removes the cork and then press the button to remove the cork from the corkscrew. Pros: Convenient, easy to use, long lasting battery, a handy foil remover, and the sleek modern design makes it an addition to any kitchen or bar. Cons: A long charging time. The base light does not change from red to blue as it does on the cork screw itself. Brewberry offers 100% customer satisfaction and a 2-year warranty. This gift set contains everything needed for the party. It contains an electric wine bottle opener tested on both natural and synthetic corks. It also comes with a foil cutter, vacuum stopper and aerator pourer for improved taste. Opens at least 40 bottles on a single charge and is easy to use, especially for those who have difficulty with manual corkscrews. It illuminates during use and you can see the cork. The foil cutter is in the low footprint charging base. Cons: Charging cord can be finicky. The Pyora Electronic Wine Opener Set is backed by a 1 year warranty. Simple and elegant appearance that highlights any kitchen. A high quality electric wine opener with a unique transparent shell. The ergonomic design does not require a base stand and is inspired by classy European styling. It can open up to 60 bottles on a single charge – making it perfect for large parties, but it is also easy to use and great for seniors and people with low strength. It is also illuminated, so the user can see what they are doing in dim, romantic lighting. Pros: Easy to use, good charge, no base stand, illuminated, foil cutter attached to top of device. It comes with a foil cutter (which is attached to the top of the device and thus easy to find), wine pourer, and stopper. It also works well with synthetic corks. This electric wine opener is a gorgeous, refined silver color, with a transparent base. The easy release lid converts to a foil cutter – meaning you never have to search for one (although some users have found that the foil cutter tends to get detached). Opens up to 40 bottles per charge, and does not need a separate base stand. It illuminates when in use and when recharging, resulting in good visibility during use even in low light or outside. The length of charge makes it suitable for commercial use, and it is also good for people who lack the strength to open wine bottles manually. Pros: Attractive appearance, foil cutter on lid, good charge, no separate stand. Cons: Foil cutter tends to become detached. It comes with a foil cutter (which is attached to the top of the device and thus easy to find). This wine opener set is the perfect gift for the wine lover in your life! This set includes a cordless electric corkscrew, foil cutter, and wine pourer. All items are stored on the included charging base. The cordless corkscrew is able to open nearly thirty bottles of wine on a single charge. It’s comfort grip is ergonomically designed to make it easy to use. When it’s time to recharge, an LED light on the charging base indicates the battery level. Corks come off in just seconds, and it’s easy to see what you’re doing thanks to the transparent shell around the corkscrew. This is definitely an easy way to get those bottles opened quickly and effortlessly. This electric wine opener is the perfect gift idea for anyone in your life who loves wine. It’s an absolute must for anyone who has trouble getting corks off the bottle without spilling the wine inside. The electric wine opener is able to be recharged with the included charging base. You’ll find that it can open nearly any wine bottle in a matter of seconds. The tuxedo black and gunmetal design will match the decor of nearly any kitchen. A foil cutter is also included as a separate item that fits into the base of this model. This wine opener is a must for anyone with a modern kitchen. The stainless steel opener features a clear casing around the corkscrew so that its easy to see what you’re doing. Wine bottles of almost any shape will open in seconds with the push of a single button. This model comes with an including charging base and foil cutter. A blue LED light illuminates while the opener is charging. A single charge will open approximately thirty bottles. The wine opener comes packaged in a beautiful gift box. This cordless wine bottle opener is able to remove the cork from just about any wine bottle in a few seconds. A single charge can give it enough power to open up to thirty bottles with the touch of a button. Corks are removed in a matter of seconds. This opener comes with the recharging base which means no batteries are needed and a soft, easy to grip handle. The opener also comes in certified frustration-free packaging, making it easy for almost anyone to open without damaging the opener. The modern design will go great with just about any kitchen decor. This cordless wine bottle opener features a modern, sleek design. More importantly, it can open up to eighty wine bottles on a single charge. This device also includes a foil cutter to neatly cut away foil wrappers without leaving behind messy pieces that stick to the bottle. This piece is easily stored in the base of the charging platform. A rubberized hand grip makes it easy to use, even for persons with limited mobility. This wine opener also features a vacuum sealer, allowing you to re-cork open bottles. This means you can store wine for months or years after it has been opened. Electric wine bottle openers offer many benefits that might set them apart from manual openers for you. Before making a decision, you should consider some of the specific characteristics of electric openers. Ease of use – The primary benefit of an electric wine bottle is that it is easier to use than a manual opener. The manual opener can be more challenging because it requires strength and dexterity to insert and turn the corkscrew, and extra exertion to remove the cork. An electric opener is operated by the push of a button and can eliminate some of the frustration and embarrassment that occurs when a cork will not budge or a portion of the cork breaks off and remains in the bottle. You could say the electric opener is a way to ensure your evening begins stress-free. Accessibility – For some wine drinkers, the additional dexterity and strength required for manual openers is not just a matter of inconvenience or stress. When suffering from arthritis, the impact of aging, or other physical disabilities, it can be difficult if not impossible to manipulate the manual opener. The easy grip and single button activation of the electric wine bottle opener allows you greater independence and control. 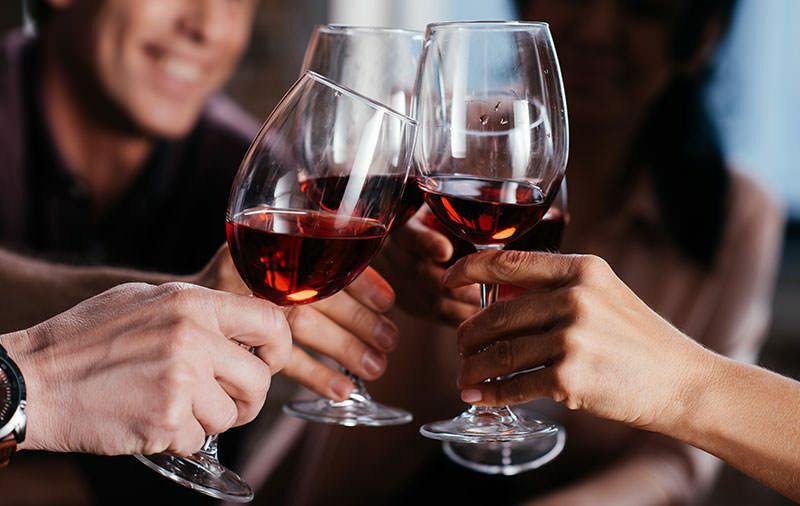 Dinner Parties – When hosting a dinner party or a gathering for a large group, you may need to open multiple bottles of wine at the same time. Even individuals who prefer manual openers may find it annoying and wearying to open three or more bottles at once. Electric openers eliminate repetitive motion and free you up to attend to other host duties more quickly. Décor – Home furnishings continue to evolve and many kitchens and bars incorporate small appliances into their look. Manual openers are usually small and often stowed away in a drawer. The electric wine bottle opener is not only functional, but can actually be a decorating accent, complementing your latest design refrigerator, sink or other appliance. When debating between an electric or manual wine bottle opener, you should investigate the individual features that make each brand and model unique. The individual features of a particular opener may be the factor that clarifies your decision. Size – Most electric wine bottle openers weigh one to two lbs. Height is often between 9 inches and 11 inches while bases can have greater variances. You should consider the maximum space you have available and whether your home will accommodate the size of the electric opener that catches your eye. Style – Electric wine bottle openers provide a number of style options. Materials can range from a rubberized nonslip grip to stainless steel, plastic or a zinc alloy. Openers are also available in a variety of colors. You can select a more elegant model in black, silver or champagne. Or you can opt for a fun approach and select a more vivid color like red or purple. Some models are even high-tech in appearance. Designed with a see-through section so you can watch the corkscrew move, a soft blue light illuminates the section both when you are operating it and when it is charging. Reflect on the interior design choices of your home, or the home of your gift recipient, to determine if there is a model that will accommodate your style. You should also consider whether you take your wine as seriously as a sommelier, or just enjoy the occasional libation, when considering a style. Functionality – Electric wine bottle openers also offer slightly diverse functionality. For example, not all openers will work on synthetic corks. In addition, while most openers are equipped with chargers, some are battery-operated. Those that are sold with chargers will differ in the amount of time it takes to charge the opener and the number of bottles that can be opened on one charge. Consider the type of corking used on your favorite wine and the frequency with which you will use the opener to determine the most appropriate model for your home. Accessories – A wide array of accessories may accompany an electric wine bottle opener and may be one of the clearest ways they differentiate themselves from one another. In evaluating an opener, decide which accessories are essential to you. Most openers include a foil cutter to enable easy access to the cork. However, they provide different means of storing the cutters. Some provide a small storage crevice while others just have space for it to be left out on the charger. Elegant models may be partnered with other professional devices. An aerator may be included to reduce the amount of time the wine needs to be allowed to breathe. Or an opener may be sold with a companion chiller so you do not have deal with the traditional ice bucket or dripping water as the ice melts and the wine warms. Similarly, some openers may be packaged with a preserver or sealer. If you are not sure you will finish all the bottles of wine that are opened, you may want to preserve and reseal your bottles to prevent early oxidation. 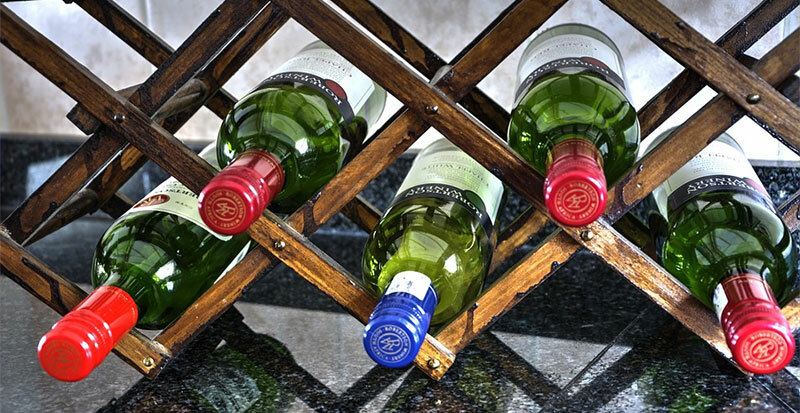 Other openers are sold in sets with more common accessories like wine pourers or wine stoppers. And formal gift sets may be available with combinations of accessories. Operation – The electric wine bottle openers are all easy to use and generally involve the following steps. The first step is the easiest. Simply use the foil cutter to remove the foil wrapper from the bottle. The next steps are literally as easy as pushing a few buttons. Center the opener on top of the bottle and press the button to insert the corkscrew into the cork. The opener will generally stop itself when it has fully extended. Then press the button again to retract the corkscrew and remove the cork from the bottle. The button may need to be pressed once more to remove the cork from the opener and return the corkscrew to its initial position. For at least some models, you may only have one button. For those models, you push the bottom of the button to insert the corkscrew, and the top of the button to remove it. You may need to depress and hold the button down for the entire length of time it takes to capture the cork. Cleaning – Maintenance is also simple. Most models can simply be wiped off with a soft cloth. Charging – Like all battery-operated appliances, you will need to periodically replace batteries or recharge the unit. The opener will need to be situated in an upright position in the charger in order to fully connect. How often you have to charge the opener will depend on the frequency with which you use it and how many bottles you open with each use. The use and care of an electric wine bottle opener could not be easier and is a persuasive argument for adding one to your home appliance collection. Personality – Are you or the recipient of your gift a gadget-lover? If so, the electric wine bottle opener is the probably the best match for your lifestyle. But if you prefer to keep it simple, you may want to stay with a manual opener. Control – Sometimes it all comes down to your ability to control a situation. Are you or your gift recipient comfortable if you are not able to direct the corkscrew, watch the machinations or manipulate the extraction of the cork? If not, you may not embrace the electric opener technology. Storage – Although most electric wine openers take little space, with so many small appliances available today, you need to determine whether you or your gift recipient have or can create sufficient room on the counter to store the opener. In order to take advantage of a charging station the opener should be stored within easy reach. Dexterity – As mentioned above, physical limitations may make it an easy choice. Do you or your gift recipient experience difficulty in gripping items as a result of health or age issues? If so, an electric wine opener will significantly reduce or eliminate problems opening your favorite vintage. Price – Often, the bottom-line comes down to price. Review your budget and determine your price range before deciding whether an electric wine bottle opener will work for you. Remember that the price will vary based on the style and accessories you add. If you keep to the basics, you can find reasonable rates. If you are someone who carefully purchases a bottle of wine based on the event you are going to or meal you are preparing, then you should also carefully choose the way in which you open that bottle of wine. For years, the traditional corkscrew opener has been the most popular option for wine drinkers. However, while they are traditional, they are not necessarily the best option. There are many benefits to using an electric wine bottle opener instead of a traditional corkscrew. If you want to get the most of your wine drinking experience, you should really consider purchasing one of these nifty gadgets. Anyone who has opened a bottle of wine with a traditional corkscrew knows to aim carefully at the center of cork in order for it to be removed accurately and with ease. However, if you are someone who doesn’t have steady hands, this is easier said than done. A great advantage of electric wine bottle openers is that no steady hands are required or tricky turning of the wrist to maneuver the cork the way you need it to. You simply need to place the device on top of the cork and press a button and the rest takes care of itself. If you’ve ever had the unfortunate experience of a corkscrew opener breaking mid twist and leaving you without a means to open your wine bottle, then you know that this model isn’t always reliable. Electric wine openers are great because they eliminate the chance of anything breaking if too much force is applied. In fact, no force needs to be applied other than the light touch of a button and the simple untwisting of the removed cork. Perhaps you need to open a lot of bottles of wine at once. Using the traditional corkscrew can take awhile, and your hand is only going to get more and more tired with each bottle, making the process even slower. Electric wine openers open the bottle in mere seconds so you don’t have to worry about this. Once the first cork is removed, all you have to do is place the opener on the next bottle and push the button again. The traditional corkscrew opener can pose a safety concern if the bottle is not opened properly. Losing control of your hand can cause the cork to pop and fly off and wine to splatter everywhere. If this happens, there is no safeguard to protect any innocent bystanders. Electric openers pose virtually no safety hazards and are designed to make it impossible for things to go haywire. Electric wine openers also have a sleek design that fits well into any stylish event you may be hosting. They are undoubtedly the most reliable option for openers and should be a staple item for all serious wine enthusiasts. In summary, electric wine bottle openers provide easy, quick access to your nectar of choice. Available in multiple designs, sizes and accompanying accessories, one of the openers is sure to match your personal style. Whether you are preparing for relaxing evenings alone, romantic evenings for two in front of the fire, your next family gathering or wine tasting party, there is an electric wine bottle opener just right for you!